The tanks are refrigerated and insulated as the main requirement of dairy tanks is that they are able to keep the milk and dairy products at a certain cold temperature. This is important to maintain health standards of the products as bacteria and diseases can grow rapidly on dairy products that are not refrigerated and processed in a timely manner. The dairy industry has some of the highest standards in terms of requirements for cleanliness and processing materials, and tanks used for milk storage need to be inspected to ensure their design, construction and material choice are the most ideal for the purpose. Dairy tanks are made of stainless steel as it is one of the most sanitary manufacturing options. It is easy to clean and does not stain nor does it absorb any of the products it comes into contact with. Furthermore, it is corrosion resistant and will not rust, even when exposed to moisture for prolonged periods of time. Other advantages to using stainless steel storage tanks include the durability and cost-effectiveness of the material. Stainless steel is also commonly used in other food processing applications, such as mixing tanks or water tanks, due to these properties. Milk is transported using sterile tubes from the milking machines into the dairy tank. It is often cooled using a heat exchanger as the milk is warm when collected directly from the cows. The tanks can range in size from as low as 100 gallons up to thousands of gallons, depending both on the size of the dairy and the processing and transportation capabilities. It is stored temporarily in those holding tanks until being transferred to refrigerated trucks for transportation to processing and packaging plants. 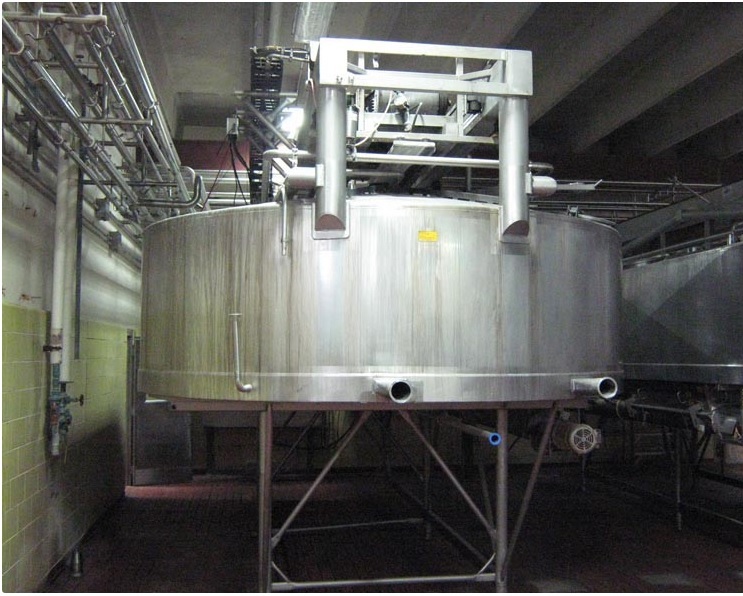 Dairy tanks are a necessary element of dairy product processing, and yet there are points to consider when determining the design specifics of a tank. Most importantly, a tank needs to be able to be cleaned and sanitized, and inspected for rust or other degradation. Tanks need to be thoroughly cleaned in between each load of milk and therefore need to be durable enough to withstand repeated cleaning as well as simple enough to ensure thorough sanitization with each clean. While stainless steel is the most common material used in dairy tank construction, some glass, plastic, or rubber products are also used and these need to be high quality materials to ensure sanitary processes. Dairy Tanks Dairy tanks are stainless steel containment reservoirs used for the storage of milk and dairy products until they are transported to their next processing location.